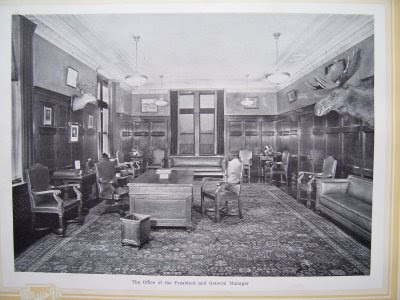 Although this looks like the study where Arthur Conan Doyle wrote the Sherlock Holmes stories, it's actually the old office of the Buick president and general manager. Not sure if the moose head was standard or if you had to really go out and shoot it. I always feel like a slacker when I visit Gerry Godin's All Things Buick blog. I tend to go for the quick hits on a topic, hoping that readers can fill in the gaps and not point out too many of my errors. (Translation: I'm kind of lazy.) Gerry takes a more authoritative approach and covers things in depth. I spend way too much time at his site, often reading about factories that are only memories now. Right now he has high quality, easily readable scans of an amazing book called The Factory Behind the Car: An Illustrated Story of the Immense Manufacturing Organization that Builds Buick Valve-in Head Motor Cars. Clearly, Buick likes to do things big, even book titles. And if you don't think too much about how things have changed, it's a fun read. "All Things Buick" is a very cool web-site. It just made it into my "favorites" folder. That's a tough accomplishment.